: Please go over Data Dictionaries. But you can only get credit for 8. See [ finals.html ] and [ mock.html ] for more info. One sheet, 8.5><11 or smaller, both sides, any size font. The final has one question that requires a ERD and another some DFDs. Yes -- all the diagrams, notations, and algorithms. Look at past questions. Try to do them. Compare answers with (1) the notes, (2) other people's answers or bring them to my office. I grade each question separately with names hidden -- as far as I can. I then add up the points from the 8 questions you've done. This is less than 200 points.... and I add it to the rest including any bonuses. They do. But promotable programmers will do them as well as. Why -- To uncover the hidden logic in given sample data. And to remove anomalies from your data base/data structures. Please go over Data Dictionaries. A data dictionary is a list of definitions. Each definition defines in detail the terms that appear in the analysis and design. It should describe: external entities, Data Stores, processes, data flows, entities, attributes=elements, aliasses, normalized data tables, keys, business rules, conditions, algorithms, etc. It should define syntax and semantics. It should provide some clues as to the purpose of the data. The function of a data dictionary is to provide accurate answers to questions like "What do mean by ....". It may (I guess) even have use cases in it. No.... you could do either first depending on what is going on. But.... there is a link -- Correct DFD have data stores named the same as entities in the ERD. There is know way to deduce the structure of data (ERD) from the processing(DFD), and vice versa. No.... it describes how to finish the project.... the steps that convert designs into running systems. 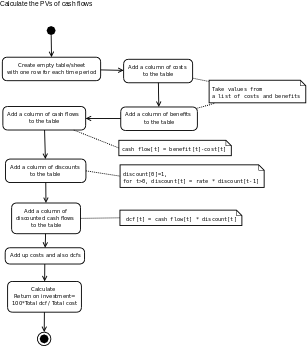 Use activity diagrams to describe complex algorithms and procedures. They are not good at data. Use ERDs to describe data. They are no good at defining processes. If you need to define both data and processes.... use a DFD to connect them! (Done with Apple iMac Pages). Or this rough draft [ costBenefit1.tif ] (Tagged Information File Format? Scanned from pencil sketch). Or this [ costBenefit2.gif ] [ costBenefit2.png ] (Calculate PVs of Cash Flows done with Dia). Know the names of the different kinds of tests and what they stand for. The Trad SDLC shown in this class is fundamental. But also know the agile processes that improve on it. You also need an OO software development process and a structured process. MS Access and FileVision are easy to use and limited in possibilities. Take CSE375 -- it is all about use cases as a tool for analysing requirements and coming up with software designs. Right now start at [ r2.html#Use cases on the Wikipedia ] and read the 6 linked pages, and two books that follow. A use case diagram should show many use cases. If possible, all of them. Other wise you have to package several use cases and have a use case diagram for each package -- this is when you have 20 or 30 or more use cases. Also the use cases are not oversimplified. I choose enterprises that (1) are easy to get to, (2) are good examples, and (3) I have contacts. I was lucky that our IT people fitted the bill. (and don't try to be too clever). This question caused me a lot of thought rechecking my problem analysis and requirements for my web pages. The text books are expensive. So students can not get a copy until too late. The text books do not match my objectives for this class. So, I spend a lot of time correcting the book and skipping large chunks of it. So, the money is wasted any way. Previously, faced with this problem, I wrote a text and the book store published it and charged an embarrassing amount even tho' I got nothing out of the transaction. Asking the campus photocopying service to print copies would kill the CSE budget. Hence all the pages are in plain static HTML with a few simple styles and forms. The time is probably right to go to more complex style sheets. The cost (my time is at a premium) of changing 1000 pages to a more complex technology -- say a content management system -- is greater than any expected benefits. A senior project to redesign the look and feel has yet to produce any results I can use. I could include more interaction. I have a feature in my current system for embedding multichoice review questions -- the only only reason I haven't done them in my current classes is lack of ideas, energy, and time. Here is a sample [ ../cs360/notes/03.logout.html#Questions ] (by the way, the "plugin" link is dead). Another step forward into rich media looks feasible. But experiments have not paid off. I twice I experimented with including audio -- (1) directly in pages, and (2) as Podcasts -- and wasted the time generating them. The Podcast files took up all the available storage on the web server that quarter as well. Doing good video, in my experience, takes more expertise and equipment than this campus provides.